Win up to Rs. 5,000 Cashback on electricity Bill payment. Amazon offers on DTH, Broadband, Electricity, Landline & electricity bill payment. Amazon is providing cashback of Rs. 10 to Rs. 5000 bill payment. Amazon Pay bill payment offers for the month announced with up to Rs. 5,000 cashback. Save on electricity bill payment, postpaid bills, and DTH recharge. Recently, Amazon introduced "Ab Bada Hoga Rupiya" cashback offers when shopping on partner stores using pay balance. In the meantime, check Amazon Coupons for fashion, groceries and more. You can check the Amazon Pay Recharge offers to save up to Rs. 100 on mobile recharge. We also have done articles on Amazon Pay food & travel offers. Note: This time Amazon is giving cashback in a different way. The cashback amount will be between Rs. 10 to Rs. 1000. Pay your electricity bill with Amazon pay balance and get flat Rs. 50 back. 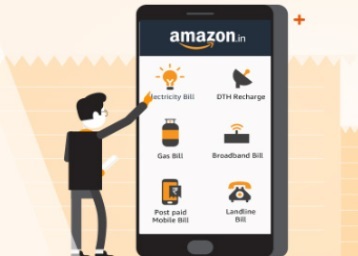 Amazon electricity bill payment offer is applicable on minimum transaction of Rs. 300. The cashback amount is Rs. 50. The offer on electricity bill payment is valid once per user till 30th April. Last month, the cashback amount was random for electricity bill payment but this month you get flat Rs. 50 cashback. Minimum Bill Payment of Rs. 300. Note: Bill Payment is only available on Amazon app. Collect the offers from pay bills options on Amazon app. Minimum Transaction of Rs. 150. Select the operator to proceed. Choose payment by Amazon Pay Balance. Log in with your Amazon username & password. The cashback will be credited within 3 working days of the transaction. Select a service of your choice. Select the service of choice on Amazon. Choose payment with Amazon Pay. Amazon Pay is a widely accepted mode of payment across merchant sites. It is not only easy to use but provides savings as well. Amazon pay offers on utility bills can help you save up to Rs. 1000 in a month. Use Amazon Pay balance across different merchant sites to save on broadband, landline, postpaid, DTH, and electricity bill payments. Saving on your monthly expenses gives great satisfaction. The online bill payment offers are an easy chance to save money on different utility transactions. With Amazon Pay Bill Payments offers, you can save on mobile recharge, postpaid bills, DTH recharge and more. The cashback amount for all mobile recharge and bill payment transactions is between Rs. 10 to Rs. 1,000.